I have a confession to make. I do not love marmalade. I know I should. I want to. All that gorgeous fruit in colorful arrays, brightening the cold winter days. The smell of cooking marmalade is divine. I love citrus rind in dressings and desserts, risottos and sauces. But when it comes to spreading it on toast, the bitterness is to much for me. I love bitter things, just not on my toast. At the market the other day, I saw a lovely pile of kumquats. Kumquats are such strange little fruits with their sweet rind and sour centers, kind of like sour candies that the kids love (OK, me too). Wait, maybe I should try marmalade with these. Eureka! 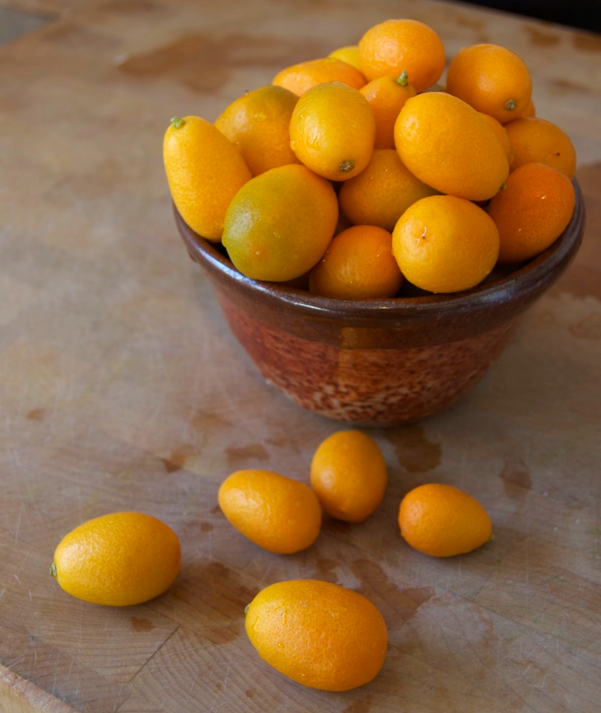 Here follows my simple kumquat marmalade recipe. It doesn’t require days of soaking, boiling, and straining like many recipes. The sweetness of the kumquat peel mixed with the tartness of the juice make for a wonderfully tangy jam, while the bitterness takes a far back seat in the proceedings. I made a very small batch, so don’t be intimidated if you can only find an 8 oz container of fruit. It totally works! The only labor intensive part of this recipe is picking the seeds out of each little kumquat. This recipe should double quite nicely. Sterilize your jars for 10 minutes in boiling water. Set aside. Add lids and rings to the hot water and leave on low. 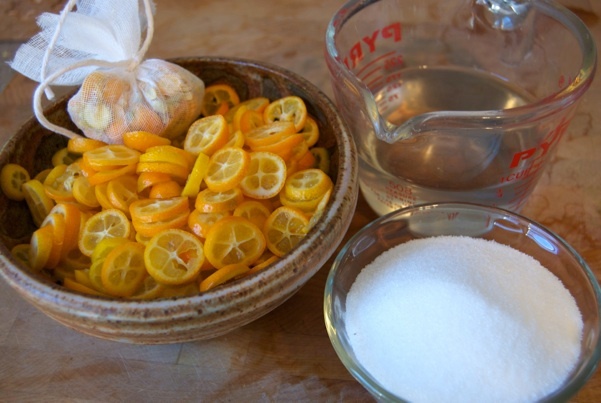 Wash and thinly slice your kumquats, reserving the ends and seeds in a separate bowl. When all the fruit is chopped, put the ends and seeds in cheese cloth and tie in a pouch. 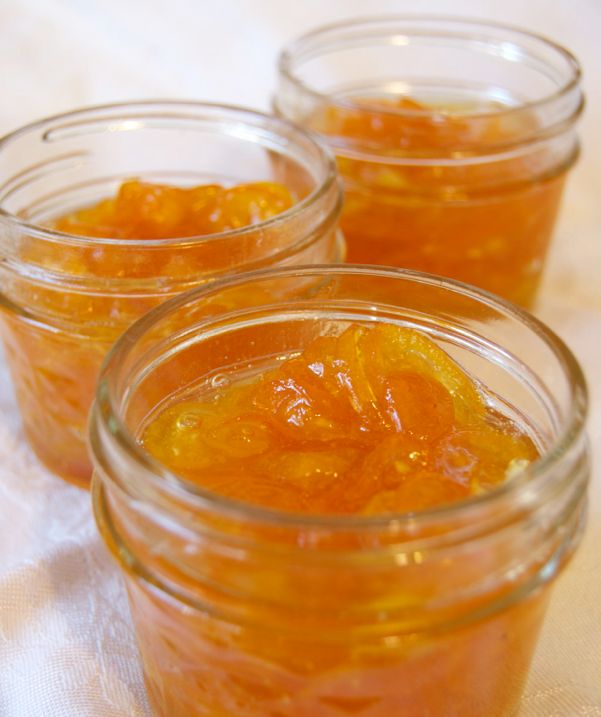 You want as much pectin as possible in your marmalade, and this will add to the batch. In a heavy bottom saucepan, bring the fruit, seed pouch and water to a boil. Simmer for 5 minutes. Add sugar and stir to dissolve. Mixture may seem thin, but don’t worry, it will thicken up. Raise temp to medium high. Stir frequently. When foam, then larger bubbles start to appear, check the temperature with a candy thermometer. Jam will set around 210-220 degrees. You can see the liquid starting to thicken as you get closer. When the jam is ready, ladle into jars. Wipe the rims, then top with hot lids. Return jars to hot water. Bring to a boil for 5 minutes. Cool on a rack. Makes 3 – 1/4 pint jars.